While traveling out of town a few months back, I dropped into a CrossFit box for a quick workout. But on my way out the door after completing the WOD, I stopped. Perched on a shelf near the entrance to the gym was a box of Power Balance wristbands. I recognized 'em from an ESPN Magazine article, which reported that these bracelets are outfitted with hologram stickers that supposedly emit frequencies that "work with your body's natural energy field" to enhance athletic ability. Mistaking my bafflement for interest, the gym owner bounded over to me to explain the benefits of the plastic hologram bracelets. "They're awesome for balance, strength and flexibility," he gushed. "Wanna try one?" How gullible could he be? I thought to myself. But then again, he's not alone; plenty of big-name college and pro athletes swear by these trinkets, including Shaq, A-Rod, Ryan Howard, Mark Sanchez, and Lamar Odom. Nor is he the only CrossFitter to advocate their use -- see examples here and here. The creators and founders of Power Balance, brothers Troy and Josh Rodarmel, started their business just three years ago by handing out the bracelets to their college buddies. 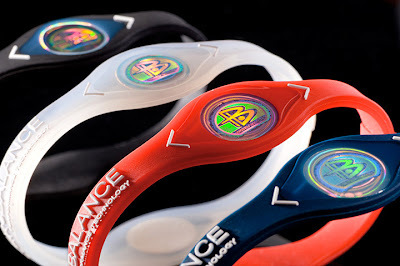 But by 2009, Power Balance wristbands were everywhere: That year, the company sold more than 2.5 million bracelets in 30 countries. Borrowed from applied kinesiology, The Test is a three-step exam of a person's balance, strength and flexibility. First, a subject is asked to stand on one leg with his or her arms held firmly out to the sides. The tester then pushes down on the arm that's on the same side as the raised leg (i.e., right leg, right arm) until the subject loses balance and falls to the side. The subject then puts on the bracelet and repeats the test. Next, as the subject holds his arms by his sides, the tester tugs down on one of the subject's cupped hands, again trying to force him off balance, first without the bracelet, then with it. Finally, the subject extends one arm in front of his face and twists at the waist to rotate his body as far as possible. Then, with the bracelet, the subject rotates once more. Many test-takers report significant improvements once they don a Power Balance wristband. "I can't tell you how the test works," says Broncos rookie Tim Tebow, who started wearing a Power Balance bracelet shortly before the 2010 NFL combine, where he tied the record for vertical jump by a quarterback. "But when I took the tests, I was like, Wow, that's crazy. They work." Or maybe not. Maybe the subjects are just demonstrating the improvement that comes with doing anything a second time. Maybe the testers wittingly or unwittingly apply pressure in subtly different ways to produce better results (push a subject's arm slightly away from him, and he'll fall; push slightly toward him, and he'll stabilize). Maybe it's the power of suggestion at work. And maybe the whole thing -- from the mylar holograms to The Test -- is a huge crock. Unsurprisingly, it turns out it was a huge crock -- a money-making trick rather than just an illusion caused by the placebo effect. As Deadspin reported today, Power Balance has been forced by Australian authorities to admit that there is in fact "no credible scientific evidence that supports [their] claims" and that the company has "engaged in misleading conduct" in hawking the wristbands. So if you're looking to improve your strength, balance and flexibility, guess you'll have to do it the old fashioned way and ACTUALLY WORK FOR IT rather than rely on magical powers channeled by shiny stickers on plastic bracelets.